Another Wednesday, another Waiting for. And, after yesterday's fairly epic-in-length Gifts for Geeks post, I have to say, I don't remember the last time I wrote so much for this blog. Hopefully it served as a nice little primer for all you geek gift receivers or geek gift...uh...buyer's for. Yeah, I'll go with that. Anywho, as always, we encourage you all to contribute your own gift ideas, as I know there were plenty of things I left off my list. I should have another Gift Guide post coming up by week's end with some non-comics stuff thrown in for good measure. But, in the meantime, let's talk about more things for you to buy! This week, comics ship on their regular day, so after one of those weird, unholy Thursday-shipping weeks, we're back to normal. Or as normal as we can get. And today looks to be a healthy week--not massive like the one a couple of weeks back, but certainly substantive. Personally, this week is going to be another one of those trimmed-down-below-fighting-weight purchasing fares for me, but please don't let that stop you from going nuts at the cash register. Goodness knows the comics shops can use your business. Actually, I'm wondering how shops are doing at this point in the holiday season. My LCS seems to be trucking along, and while not breaking records with sales figures, it seems to be in pretty decent shape. I know several other small retail store owners (some in comics, some not), and they all say the same thing when I ask how they're holding up--it could be better, it could be worse. Unfortunately, "worse" this year means "closing," so let's hope it doesn't get any less okay than it is now. I've seen plenty of people in the malls and at department stores, and I haven't noticed any huge drop-off in the number of customers coming into the comics shop each week, so hopefully we won't lose too many shops to the current economy. Anyway, you can do your part by going out this afternoon and purchasing any (or all!) of the following comics. 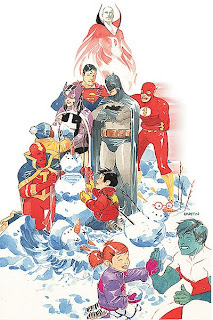 First up, we have the continuation of a time-honored holiday tradition--the DC Holiday Special 2009. It's 32 pages of mostly useless holiday fare starring characters like Deadman and something called the B'wana Beast, but, c'mon! I love these stupid, oversized books, and I make a point of it to sit down by the fire on Christmas Eve, kick my feet up, ignore my family, and read Christmas themed comic books. What can I say? Tradition's tradition! Here's the (awesome) Dustin Nguyen cover. There are some really great lesser-known creators on the book this year, such as Jay Faerber (Dynamo 5), Jay Torres, and Sterling Gates. Each creative team will tell a short, five or six page, self-contained story, then pass things off to the next. Now, if you're looking for the next Dark Knight Returns, then don't bother with this yearly title. But if you want something light and fluffy and fun for this holiday season, then grab a copy today. Be warned, though--the book clocks in at 32 pages and carries the (too steep) cover price of $5.99. Six bucks for a comic is just something that I will never, EVER be able to wrap my head around, but I guess the thinking is that the publisher knows they won't sell tons of these things. So, to defer costs on the extra pages and creative teams, they pump up the price. This year especially, it would have been a nice little present under the tree had DC reduced the cost to, say, $3.99. You know, as a way of saying "thanks for buying our stuff every week." Ah, well. There's always next year, I guess. Now, last year's Special was very much a meh book for me (and I hate the word meh), but there were a couple of solid stories that helped pass the time before Christmas dinner was served. But the best holiday book DC put out last year was a Hellblazer special, featuring some really...um, let's call them...different...takes on the yule tide. Still, there's a solid lineup of talent on the roster for this year's book, so here's hoping it lives up to its six dollar price point. Next up we have an...odd choice, for a number of reasons. 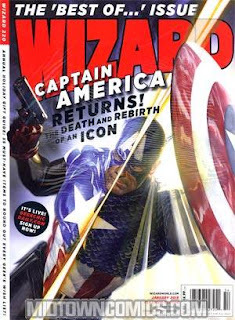 A couple of weeks ago, Wizard Magazine released the first (called the "gold" issue) of a two-part retrospective to coincide with their 220th issue. That first part contained a look back on the past decade of comics work. It showcased the best writers, artists, and titles of the past ten years, and it featured some really cool interviews and features. I can honestly say that (despite the numerous--and strange--typos I found in the magazine) it was the best issue of Wizard I've read in...well. I'm not sure how long, actually, but it was a good, solid issue, with actual content and not just screaming promotional material for DC and Marvel. Sure, there was no price guide in the book (as they have done away with what used to be the book's main selling point), but the focus on comics, comics, comics, and nothing but comics was nice, for a change. This week, they release their annual year-end issue (called the "platinum" issue), filled with the best and worst of the past 12 months. These year-enders are usually heavy on the fluff, but I have a good feeling about this week's issue, mostly because of how solid the "platinum" issue was. Now, yes, I hate the fact that there is a "gold" and "platinum" edition of this book, as it's a disposable magazine with many fewer pages than Wizard issues in the past. And, yes, I would have liked it much better had they combined the "gold" and "platinum" issues into one issue, but what can you do? They're trying to figure things out over there, and they're desperately seeking relevance in today's world of Newsaramas and Twitter pages. It's funny that, in my mind, they managed to achieve relevance with number 220 by going back over the events that transpired in this past decade. It was an important decade for comics--maybe the most important one since the days of Stan and Jack and the original Marvel Bullpen. The comics industry rose from the ashes of the 90's boom and bust in the last decade, and we saw the ascension of the comics writer as the main draw to a title. And, of course, for better or worse, Wizard was there every step of the way. So, when you get to the shop today, check to see if your retailer still has any copies of the "gold" edition, because I think anyone who either got into comics in the past ten years, or who read Wizard at any point in the past ten years, will really enjoy it. I'm going to leave things here for today, since my not-so-little fingers are burning from all the typing I've been doing these last couple of days. But before I go, what are you Waiting for? I haven't really been interested in the Dark Reign storyline; I think it's a stupid idea and I think the storyline that spawned it was a terrible idea as well. That having been said, I've been reading Dark X-Men -- I read the first issue on a whim, and then I read the second issue because the first issue had X-Man in it. Nate Grey was one of my favorite characters for a number of reasons, so I was disappointed when his series came to a crappy end. Dark X-Men just became a book worth my time when he showed up for a bit longer in the second issue; it seems like their storyline will be about him more than anything else. I still wish he had his own book again, though. They're making so many other (crappy) ones, why not make his?